This peptide spot treatment serum minimizes the appearance of expression lines in areas of repeated muscle movement, like crow’s feet, laugh lines and between the eyebrows. 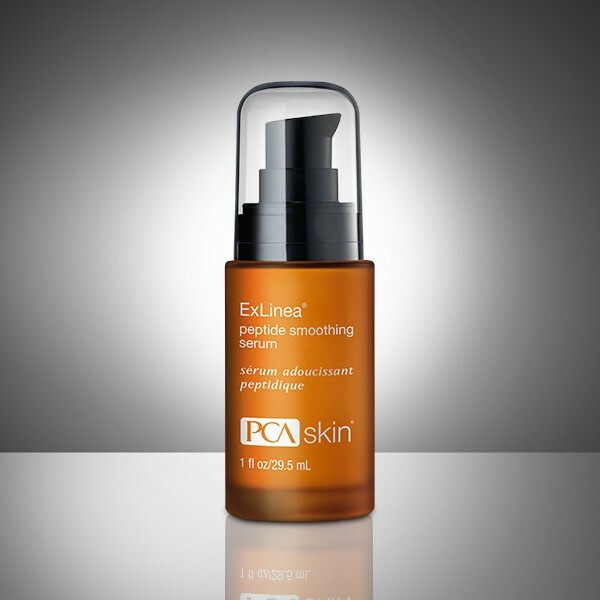 This peptide spot treatment serum minimizes the appearance of expression lines and hydrates, smooths and firms aging skin. After cleansing and toning, apply one to two pumps onto areas of wrinkling and sagging, focusing on the lines around the eyes, forehead and mouth. Follow with any other treatment serums and the appropriate PCA SKIN® broad spectrum SPF product in the daytime, or moisturizer in the evening. Improve the appearance of dark circles and puffiness while preventing fine lines around the eyes with this hydrating triple-peptide cream. Lift, firm and smooth aging skin with this powerful peptide and growth factor serum that builds volume and minimizes the appearance of pores. Visibly reduce wrinkles and build collagen with this retinol formula including niacinamide, retinopeptides, stem cell extract and vital hydrators.